Built in 1892 by Charles Henman Jr. this heavily decorated complex of buildings makes up Croydon's Town Hall. The building and the roundels are covered at Ornamental Passions. Each of the five bays of the frieze carries three portrait roundels. The names, wreathed in either oak or laurel leaves, are given along the tops of the windows just below the pediments, listed here left to right. Ornamental Passions assumes they are all the work of Edwin Roscoe Mullins who did other work on this part of the building. You would have thought that by 1892 the spelling of Shakespeare would have been sorted out. But this is not the first time we have seen it as "Shakespere" on buildings around this date. Perhaps it was a nod to the fashion for historical romanticism. Of course, in the 16th century, spelling had not settled down, to the extent that Shakespeare himself was inconsistent. His marriage certificate (necessary because at 18 he was under-age) has his name spelt as Shagspeare, accidentally, we are sure. Archbishop Tillotson takes pride of place at the centre of these portraits. He was born almost 30 years after Whitgift's death and, like Whitgift, became Archbishop of Canterbury. Other than that we can find no reason for his honoured presence here. This building was erected during his reign. 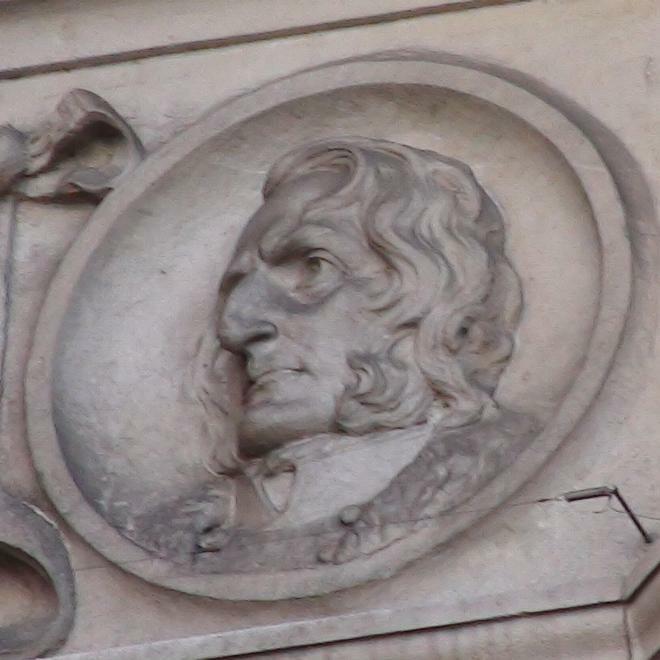 Elias George Basevi (1794 - 1845), architect.